The Archbishops of Canterbury and York have urged voters not to let anger over the expenses scandal drive them to vote for the BNP in next month's elections. 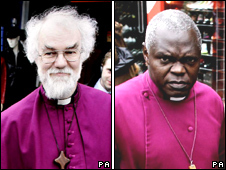 Dr Rowan Williams and Dr John Sentamu said it would be "tragic" if people abstained or voted BNP at the local and European elections on 4 June. They said disillusionment was understandable but voters should not allow their anger to be exploited. The BNP said the bishops did not represent the public's views. In a joint statement, issued on behalf of the Church of England House of Bishops, Dr Williams and Dr Sentamu said the forthcoming elections were taking place "at a time of extraordinary turbulence in our democratic system". "The temptation to stay away or register a protest vote in order to send a negative signal to the parties represented at Westminster will be strong. "In our view, however, it would be tragic if the understandable sense of anger and disillusionment with some MPs over recent revelations led voters to shun the ballot box." The archbishops appealed to voters to exercise "great vigilance" in making their decision. Some parties, they said, would exploit the current political climate to foster "fear and division within communities, especially between people of different faiths or racial background". They said, rather than caving in to anger, the elections were a chance to show higher ideals. "It is an opportunity for renewing the vision of a community united by mutual respect, high ethical standards and the pursuit of justice and peace." BNP leader Nick Griffin said support for the party was now sufficient that is was time "the Church of England grew up and decided to sit down and talk with us about the issues that we are getting across for our supporters". A BNP spokesman added: "We're the only people standing up against the new religion of multi-culturalism and the Islamification of Britain. "These church leaders don't represent the views of the public. The archbishops were trying to make themselves relevant in the modern world and the Church should stay out of politics." On a European election campaign poster, the BNP has used an image of Jesus suggesting that he would vote for the party. Leader of the Liberal Democrats Nick Clegg said the church should stay out of politics. "I don't think you beat the BNP by telling people how to vote. You get out there and say we have got the solutions, they haven't. They peddle hate and they don't actually provide people with hope," he told BBC's Politics Show. Polly Toynbee, president of the British Humanist Association, supported the church's intervention to speak out against a party they considered to be unchristian. The BBC's religious affairs correspondent, Robert Pigott, said the archbishops' appeal had been a "rare direct intervention in the electoral process". Anglican bishops have called for a BNP boycott before but "never with such unanimity and in such forthright terms", he said. The Right Reverend Peter Broadbent, Bishop of Willesden, said the archbishops' statement represented the feelings of all the Church's bishops and had come about after a bishops' meeting last week. In February the Church's general synod voted overwhelmingly in favour of measures to stop clergy joining the BNP.